A good movie is like a good soup, all you need are good ingredients cooked for the right amount of time, at the right temperature. Velvet Buzzsaw does deliver great ingredients. The movie, set in Los Angeles, offers a zoo of crazier-than-life caricatures that can be found in the wild of the art world: queer-swinging-all-ways art critic Morf Vanderwalt (Jake Gyllenhaal) whose reviews can either kill any artist’s career or make him/her instantly famous; former punk-became-ruthless art dealer Rhodora Haze (Rene Russo); her business partner Jozephina (fabulous Brit Zawe Ashton) whose ethics can be summed up in “the end justifies the means”; Gretchen (Toni Collette) a museum curator transitioning to become a private consultant for the big bucks and Piers, (John Malkovich) a depressed and blasé artist who is looking for renewed inspiration. Satellite cast includes unlucky gallery assistant Coco (Natalia Dyer, a familiar face from Netflix “Stranger Things”), gallery handyman Bryson (Billy Magnussen); gallerist competitor Jon Dondon (Tom Sturridge) and emerging artist Damrish (Daveed Diggs). The film starts in Miami during the Basel Art fair. We follow art critic Morf, running from one booth to another, bumping into all the protagonists of the plot. He is there to write about Piers, but word on the street is the artist is leaving Haze gallery for Dondon. Meanwhile Gretchen of LAMA Museum (the “C” for county was purposely dropped) is getting ready to select more of Piers’ works for an upcoming retrospective and also looking for edgy new pieces – here a metal sphere, which “holes can be filled by viewers to experience outworldly sensations”. While assistants and installers get yelled at, artists are challenged to remain within the gallery roaster, art critics are begged to write positive reviews to make million dollar sales happen and gallerists mingling with vodka shots at the bar are on the hunt for the next new money-making thing. Director Dan Gilroy (whose “Nightcrawler” film debut in 2014 had already cast duo Rene Russo and Jake Gyllenhaal) does not even grossly exaggerate what a mean, inauthentic environment the safari that is the art world can often be. Velvet Buzzsaw gets its title from Haze’s stage name as a punk musician, way before she entered the art business when she was still young. How much damage can a buzzsaw do if it’s made of velvet? Well not much in appearance, yet here as a metaphor of the art business where air kisses, fast convertibles, and big lofts are smoothly in order, so are backstabbers, cruelty and sociopath egomaniacs. Back in L.A. after the fair, everyone gets busy preparing exhibitions revolving around Piers, pre-selling artwork in big white rectangle art spaces to Berlin and New York clients. Jozephina, the 30-something unmotivated partner of Haze (she’s having an unconvincing fling with Morf and is always late at work) makes a discovery that will turn the over the top comedy spirit of the movie into a mystery thriller. It occurs that her quite old upstairs neighbor, Ventril Dease, has just died leaving no heir but a cat that is annoyingly mewing. Touched by the screams of the lonely pet, she goes up to the empty apartment one night to make a startling discovery: the old man was an artist who had lived hoarding hundreds of canvases, drawings, paintings – some of them with an almost alive, dark and creepy feel. Well aware of how this priceless treasure could be life changing and realizing she has no outlet to sell the artworks, Jozephina gets forced into a deal by Rhodora Haze, who sees an opportunity to gain millions and make it up for Piers’ desertion. The gallerist has already rewritten the story: the artwork was found in a dumpster, giving it more potential value and no traceability. Because “it’s all about perception” and after all of them are catalogued by her team, she decides to send the biggest chunk to storage in order to create a false sense of rarity. Sales can then begin. Spoiler alert, from this paragraph on, read at your own risks because it is not easy at this point of the story to tell more without telling too much of it. When we learn from the will of Mr. Dease that not only did he never have the intention of selling his work, he also had strictly specified that all of it had to be burnt and never to be sold (with an emphasis on never). This is when the movie goes gory. It seems as if Director Dan Gilroy decided that all his horrid characters needed to pay for their awful behaviors and flaws. The curse then becomes a pretext to explain how, via paranormal activities, everyone is going to suffer. At this point into the film, Gilroy has lost his audience a bit and our initial soup which had great ingredients to start – a phenomenal cast and a definitely interesting and unique plot – is starting to feel a bit overcooked. The mismatch of the storylines has become deluding and the gore has overtaken the intrigue, sending Gilroy’s personal yet universal vision of the artworld to the far background. Nevertheless we still manage to laugh at the absurdity of the situations and at the over-caricatured characters. 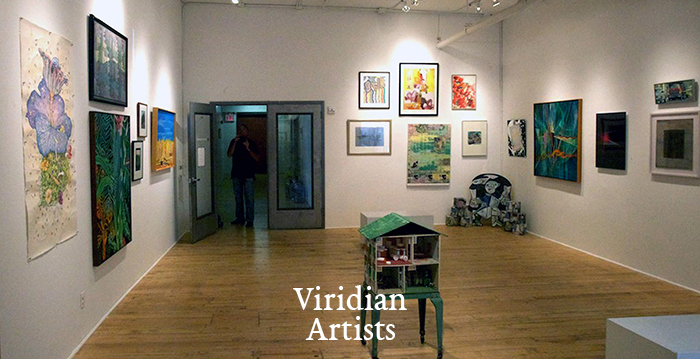 If you are an artist or simply someone interested in what the artworld looks like most of the time, then maybe Velvet Buzzsaw is a soup where to wet your whistle. 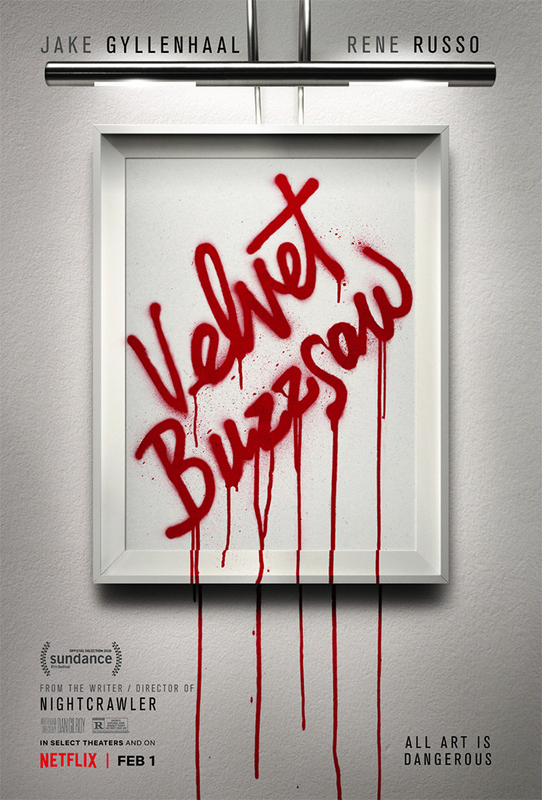 “Velvet Buzzsaw” on view on Netflix and in selected theaters starting February 1, 2019.